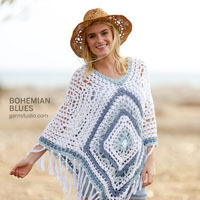 Go to original pattern for design DROPS Extra 0-1444. 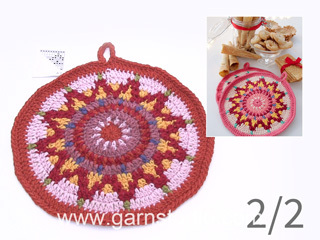 Crocheted pot holders in DROPS Paris. The piece is worked in the round in a circle and with colored pattern. Theme: Christmas. Measurements: approx. 20 cm = 8” in diameter. 18 double crochets in width and 10.5 rows in height = 10 x 10 cm = 4” x 4”. DROPS CROCHET HOOK SIZE 3.5 MM = Us E/4. The hook size is only a guide. If you have too many stitches on 10 cm = 4”, change to a larger hook size. 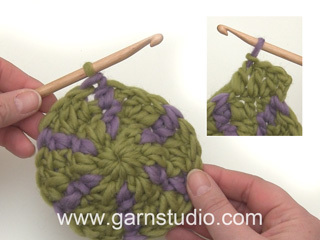 If you have too few stitches on 10 cm = 4”, change to a smaller hook size. When changing color at the beginning of a round, work the slip stitch at the end of the previous round with the new color. 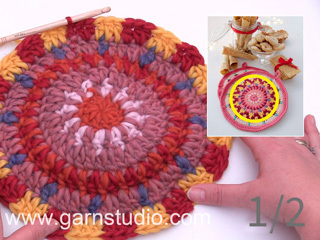 When using several colors on a round of double crochets work as follows: Work the last treble crochet with the first color, but wait with the last pull-through, change to the next color and work the pull-through with this color, then work the next double crochet. When working with two colors, lay the strand of the color not being used over the stitches from the previous round. Work around the strand so that it is hidden and carried forward. At the beginning of each round of double crochets, replace the first double crochet with 3 chain stitches. 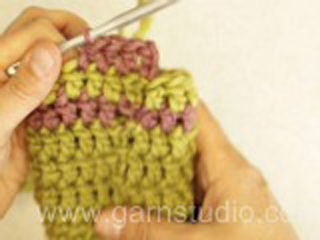 The round finishes with 1 slip stitch in the 3rd chain stitch at the beginning of the round. At the beginning of each round of single crochets start with 1 chain stitch; this chain stitch does not replace the first single crochet. The round finishes with 1 slip stitch in the first single crochet on the round. 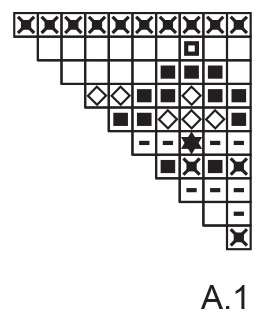 See diagram A.1. 1 square = 1 double crochet. The piece is worked in the round in a circle and from the middle outwards. Work 2 pot holders. 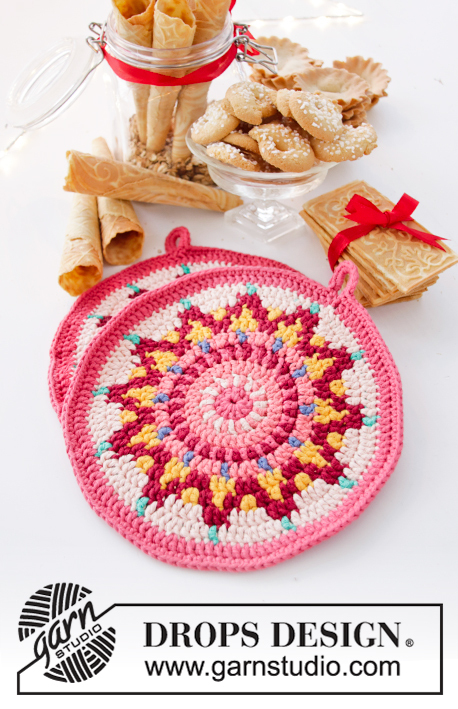 Work 4 chain stitches with hook size 3.5 mm = US E/4 and raspberry. 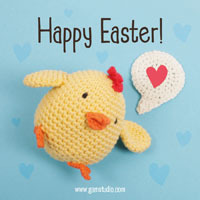 Form them into a ring with 1 slip stitch in the first chain stitch. 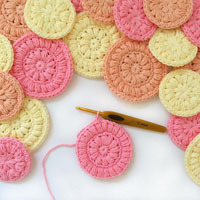 Then work in the round according to diagram A.1 (work 12 repeats of A.1 in width) – read COLOR PATTERN! ROUND 1: Work 12 double crochets around the ring – read CROCHET INFORMATION! ROUND 2: Work 2 double crochets in each double crochet = 24 double crochets. ROUND 3: Work * 1 double crochet in the first double crochet, 2 double crochets in the next double crochet *, work from *-* to end of round = 36 double crochets. ROUND 4: Work * 1 double crochet in each of the first 2 double crochets, 2 double crochets in the next double crochet *, work from *-* to end of round = 48 double crochets. REMEMBER THE CROCHET GAUGE! ROUNDS 5-10: Continue with increases and pattern as before, i.e. on each round, work 1 more double crochet between increases = 120 double crochets. 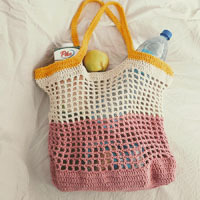 ROUND 11: Work the last round with raspberry as follows: Work 10 chain stitches for loop, 1 single crochet in the first stitch of the round, then continue in the round with 1 single crochet in each stitch and finish with 10 single crochets around the 10 chain stitches for loop. The pot holder measures approx. 20 cm = 8” in diameter. Work 1 more pot holder in the same way.